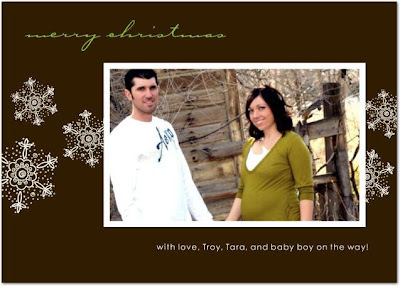 I am a slacker on posting I know but just thought I would share our christms card with everyone! My sister took this picture isn't she good? There are more I need to put up but I have been so busy trying to finish christmas shopping but I will soon! Cute card! Next year it will be one with you holding your little guy! I love this!! you guys both look so cute!! im so excited for you to have your baby! !